Santa Ana, CA (10/31/2011)  Joan Stein and Richard Frankel (Producers) announced recently that the new theatrical event Standing On Ceremony: The Gay Marriage Plays, which premieres Off Broadway at the Minetta Lane Theatre in NYC this fall, will join with Tectonic Theater Project (Moisés Kaufman, Artistic Director; Greg Reiner, Executive Director) to help take the plays message of marriage equality across the globe. On Monday, November 7, across America and beyond, curtains will rise on Standing On Ceremony: The Gay Marriage Plays as participating theaters everywhere present the play to raise awareness and funds in support of marriage equality. Marriage equality is an issue that transcends borders, and its vital that the message of Standing On Ceremony reaches far and wide. At Theatre Out this special performance of Standing On Ceremony will begin at 8:00 pm. Attendees will be able to participate in a Q&A sharing their experiences with the issues presented in the plays. To date, more than 40 theatres and universities are confirmed to participate, in 25 states across America including: Texas, North Dakota, Florida, Kansas and Michigan, where both gay marriage and civil unions are banned; North Carolina, where the vote on a constitutional amendment to ban gay marriage was moved up to 2012; California, where gay marriage was legalized and then overturned by the passage of Proposition 8 in 2008; and many states where marriage equality is not yet a reality. Beyond America, theatres as far flung as Sydney, Australia will also participate, making this a truly international event. Theatre Out has assembled a cast of 6 performers including Roxie Lee, Travis McHenry, Melanie Gable, Rebecca Cherkoss Jeffrey Fargo and Broadway veteran Frank DiPasquale under the direction of David C. Carnevale, Kevin Cordova, Brenda Kenworthy and Tito Ortiz. 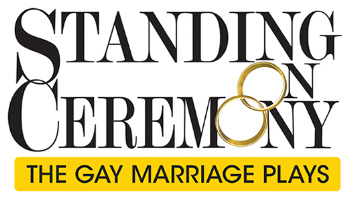 Tickets for this special performance of Standing On Ceremony: The Gay Marriage Plays are $10 and can be purchased at www.theatreout.com or at the Box Office on the night of the event.